There’s no better way to work out your brain than doing some Math exercises. We know that not everybody likes Math and it might not be your idea of fun. But with our Math games you will change your mind and train it while you have a good time. 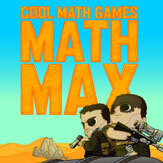 Try our online Math video games for free and show everyone how good you are at calculus. Don’t you wish to prove your high school Math teacher that, in fact, you are good at Math? With our browser games you will be able to do it and have fun with something you never thought could be entertaining. And if, on the contrary, you always have loved Math here is the way to get even better and solve problems as a way to disconnect. So take your phone or computer and let’s get concentrated!